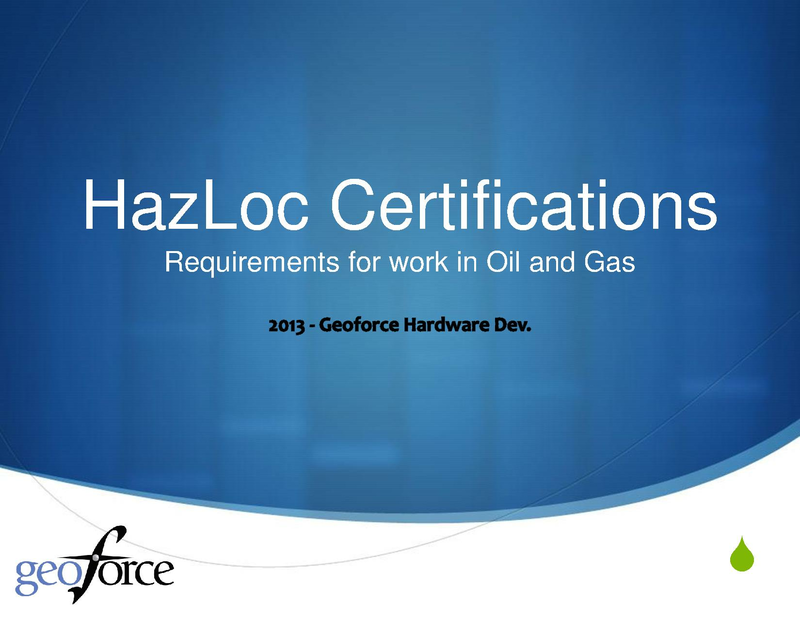 View HazLoc Certifications 2013.pdf and other presentations by dsawyers. 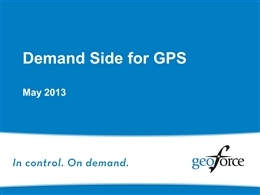 What are customers demanding? 30,000 ft view Confidence that work can safely occur within explosive environments Confidence in equipment deployed in explosive environments Safety of Personnel and Equipment Limiting of Liability GEOFORCE HARDWARE GOALS: #1 Safety is the key driver. #2 To meet the most stringent of explosion safety requirements. Common Sense on Explosion Safety In a run - of - the - mill imperfect system, there is no guarantee an explosion will NOT happen . 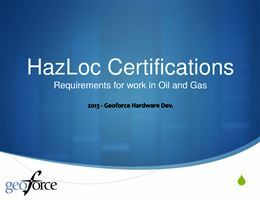 Regulators in Hazloc Safety are simply working a numbers game by estimating the probabilities an explosion will occur . By certifying products the industry is simply working very hard to limit risk and liability to some globally acceptable level . What Causes an Explosion? E xplosive environments depend on: The concentration of combustible substances (gases , mists, vapors) The concentration of oxygen or other oxidizing agent All available sources of ignition energy (electrical sparks, heat sources) If any side of the triangle is missing, combustion cannot exist (low probability). If any side of the triangle is removed combustion will extinguish. Combustion Limits What does it take for a concentration of gas to combust? Too Lean? Too Rich? Just Right! Common Heat Sources Hot surfaces Faulted/Shorted electrical components Open flames Coils , resistors, lamps Brakes or hot bearings Hot surface ignition can occur at the Auto - Ignition Temperature Stray electric currents Static electricity Radio frequency Friction sparking Switch contact sparking Lightning Auto - Ignition Temperature ( AIT): The point a substance will spontaneously ignite without additional energy . We must design in protections against these heat sources! Location Classification What does having a hazardous location mean ? What is a classified hazardous location ? A specific area or volume of interest Has equipment Classification of a location ultimately provides: A method that clearly identifies the existence of a hazardous substance H ow long/often it will be in that location Reduced overall level of installation risk through design improvements So now we know that something particular location . Equipment Classification What is a piece of classified equipment? Any equipment that is destined to operate in classified locations Has the characteristics of increased explosion risk while in operation Classification of equipment ultimately provides: A method of accountability to match equipment to classified locations. Reduced operating risk through knowledge of equipment design around us or localized to a particular location and we know how we operate in it. How do we identify hazardous equipment? Equipment Classification United States Class (Gas/Dust) Division (Hazard Severity) Protection Methods Equipment c lassification matches the location classification that it will operate in. All Others Protection Levels (Design Risk) Protection Methods Equipment classification is based on the risk a piece of equipment will cause an explosion in the first place. How do we specify which equipment is acceptable for a classified location? Closer Look: Protection Levels Cat 3 Operates in Zone 2 Gc Enhanced Protection N ormal operation safety + Cat 2 Operates in Zone 1 Gb High Protection Normal operation safety + Single fault protection Cat 1 Operates in Zone 0 Ga Very High Protection Normal operation safety + Double independent fault protection Provides for: The probability or risk equipment will cause an explosion in the first place. Specific equipment classification Specific fault tolerance Equipment design evaluation for all Zones a, b or c? Closer Look: Protection Methods Example Protection Methods Cat 1 - Zone 0 Intrinsic i Cat 2 - Zone 1 Increased Quartz/Sand Oil Cat 3 - Zone 2 Non - nA Provides for: D esign methods that achieve a specific protection level Ensures electronics will operate in specific hazardous locations Based on the removal of a side of the fire triangle ia, ib or ic ? Closer Look: Intrinsic Safety Spark Energy Limitation Operating Voltage / Current Total Capacitance / Inductance Component Separation / Creepage Distances PCB Trace Sizing/Spacing Control of M aterial Properties Thermal Energy Limitation Surface Temps < Temp Class Component Thermal R atings ( a,c ) Small C omponent Considerations Design Constraints Control of Protective Components Detailed Component Fault Analysis Manufacturing Quality Assurance Explosion Protection: Energy is limited to levels below minimum ignition energies of explosive atmospheres. No spark or any thermal effect in the circuit can cause ignition. The design is evaluated and considered inherently safe. Protection Components: Fuses, Resistors, Zener Diodes, Blocking Capacitors ia, ib or ic ? 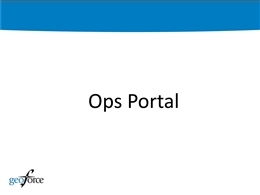 Sales/Support Toolbox What hazardous location type do you operate in? Answer should be a Zone/Class - Div What equipment rating do you expect from us? Answer should be a protection method or protection level In what hazardous atmosphere do you operate? 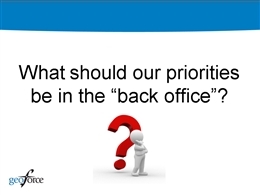 Answer should be a form of hazardous gas or dust. What operating temperatures do you experience? Do you see large impacts or shock damage? s park thermal surface temp auto - ignition temp spacings normal operation operation under faults ingress protection energy storage charge pumps total capacitance countable fault lump inductance mechanical sealing dielectrics distances through compound metal content limitations QAR/QAN h azardous area deep discharge enclosure IP protection level faulted operation surface resistivity creepage working voltage simple apparatus control drawing diode safety barrier infallible separation level of protection Questions?